I predicted, yesterday, that this had to happen, given the level of blowback from this story. 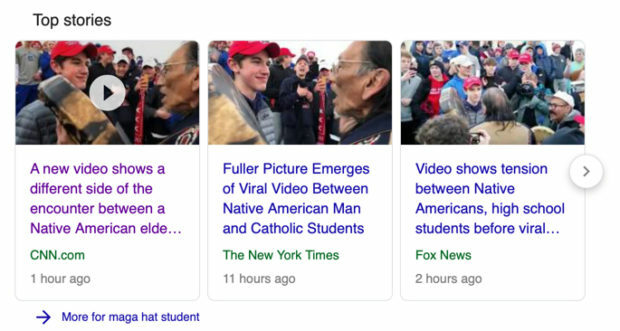 Yesterday, no less than 4 or 5 of Detroit’s major media outlets had reported the same sound bites with the same victim story, with the same photo and/or video. As late as 11pm last night, both local and national media were still reporting the same shitshow, a full 18 (or more) hours after (a) the availability of several videos showing the opposite of earlier reported (fake) headlines, as well as (b) corrections to the “official” narrative from folks who were there, witnessing the actual fracas. At 11pm, local news stations were still running editorials rehashing the fake news. Not one of the MSM punks went to any lengths whatsoever to untangle the truth. In a time not too long ago, in my youth, an editorial would have been much more likely to include some level of scrutiny and journalistic integrity. But not in the era of full-on political correctness as a cradle for the underlying victimology. And this all happened because these kids were white and they were wearing hats that reflected support for Trump. White + Trump = privileged + “racist.” That’s the common core math. Trump Derangement Syndrome triggered a huge swath of human cholesterol into an immediate frenzy. Well, let the blowback begin. Say what you want about Trump folks, but they fight back with both guns drawn, and are relentless in engaging the lies of their vicious and psychotic enemies on the Left. We could use some of that spirit in the libertarian camp.